As head coach Nathan Oystrick skated around the ice barking orders at his new players on Friday night, the Humboldt Broncos looked like any other junior hockey team in training camp. About 50 people sat in the stands watching the team for the first time since the April 6 bus crash that killed 16 people, including 10 players. Thirteen people survived the crash, including Xavier LaBelle, who was among those looking on. Oystrick said before camp got underway that he isn't sure how he will pay tribute to last year's Saskatchewan Junior Hockey League team. "Right now this is about our team moving forward, but there's definitely a lot of things in the works to honour last year's team and the people we lost," he said. Despite the increased attention to this year's edition of the Broncos, the camp had all the regular smells of any hockey practice, with sweaty gear filling Elgar Petersen Arena. A pair of ribbons with the Broncos' colours are painted into each end of the ice and a new scoreboard is in place above the team's logo. 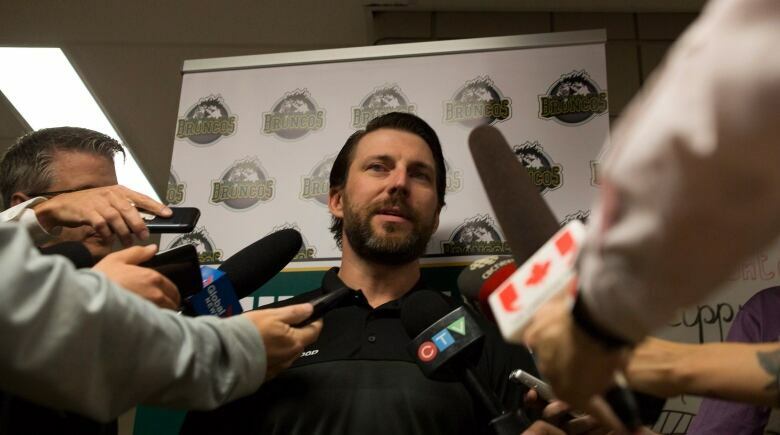 Oystrick is a former NHL defenceman who was hired last month to lead the Broncos after former head coach Darcy Haugan died in the crash. The new bench boss said he expects around 75 to 80 people to try out for his team and that it's a blank slate for everyone, including himself. 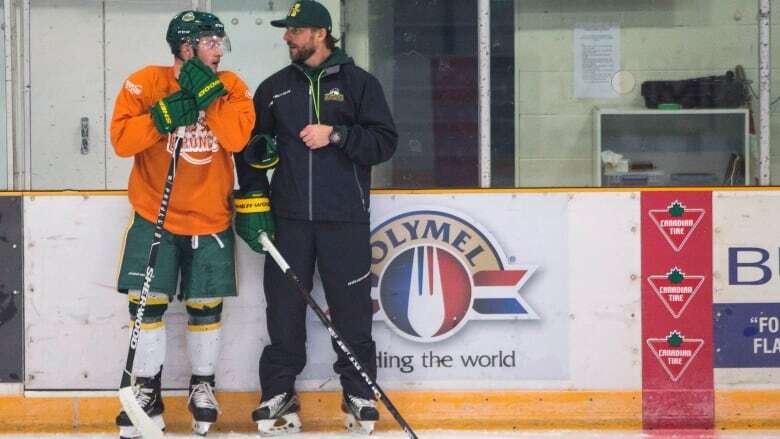 "There was some players that definitely reached out and were interested in coming to Humboldt and trying to be some sort of a help, I guess, be a part of the community and try to do their part to give back to hockey," Oystrick said. Brayden Camrud and Derek Patter are the two lone returnees from last year's team. Dane Dow, a goaltender trying out for the squad, was wearing a mask that has the names of those who died in the crash engraved into it. Chris Joseph's son Jaxon was among those who died. Joseph said that he's excited for the new group of players, although he knows they will have a lot of weight on their shoulders. "As much as we all want to remember our team from last year, we really want the Broncos to succeed and we really want them to heal," Joseph said. "We want the town to heal." Oystrick said there will be an increase in resources for the team, noting that he hired three people to help support the players. He's bringing in a person from Colorado to join the organization once a week. Oystrick, 35, was previously the head coach of Colorado Academy high school. "We need people who are willing to help our players, our staff, our community, our billets, whoever it might be," Oystrick said. "Those people are in place and they're excited to be apart of it." The Broncos' training camp runs through Sunday with a series of practices and scrimmages. They will play a few pre-season games before the regular season begins with a home game against the Nipawin Hawks on Sept. 12. "I think Sept. 12 is a big day for all of us," Oystrick said. "Once Sept. 12 hits then it's go time."